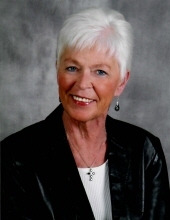 Judith Charlotte Friel, 77, of Rockford, IL, passed away on January 20, 2019. Judith was born on March 16, 1941 in Rockford, IL to Virginia (Anderson) Masterson and Woodrow Anderson. She attended Rockford East High School. Judith worked in the banking and insurance industries during her career. Judith loved spending time with her family and her dogs. She loved reading, sewing and knitting, crafts and gardening. Judith is preceded in death by her parents, Virginia Masterson and Woodrow Anderson, one brother, Donald Anderson, special mother-in-law Hazel (McCartney) Friel and her beloved daughter Kathleen (Friel) Card. Judith leaves her loving memories to be cherished by her children: Kristine (Thomas) Clark, Kelly (Holly) Friel, Kari (Neil) Vincer; son-in-law Samuel Card; brother Reggie (Cissy) Anderson; grandchildren Joshua Magnuson, Jaryd (Alex) Magnuson, Jordan (Spencer) Tingley, Sean Friel, Brock Vincer, Brianna Vincer and Bailey Vincer. Cremation Rites to be Accorded with private services to be held at a later date. McCorkle Funeral Home – Rockton Chapel, 767 N. Blackhawk Blvd., Rockton, IL assisted the family. To send flowers or a remembrance gift to the family of Judith Charlotte Friel, please visit our Tribute Store. "Email Address" would like to share the life celebration of Judith Charlotte Friel. Click on the "link" to go to share a favorite memory or leave a condolence message for the family.